Former heavyweight world champion Herbie Hide has lost his High Court case against boxing promoter Frank Warren for £50,000 missing purse money. The 37-year-old Norwich boxer claimed the money was from a six-figure fight purse when he lost his WBO world title to Ukrainian Vitali Klitschko in 1999. Mr Justice Tugendhat ruled Mr Warren had paid the boxer in full. Mr Warren said he gave the £50,000 directly to Mr Hide in cash and the judge accepted this as the truth. The case revolved around a British Boxing Board of Control decision which said 56-year-old Mr Warren owed Mr Hide £192,979.90, in relation to the Klitschko fight. 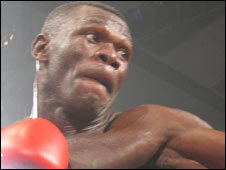 Mr Hide was making a third defence of his WBO title and lost in a second round knockout at the New London Arena, in Millwall. On 12 February 2000, Mr Warren, whose Sports Network business was at the time facing substantial legal fees relating to other cases, handed over £50,000 in cash to Mr Hide. Mr Warren told the court it was to go towards the unpaid fight purse. Mr Hide said the cash payment was agreed between the two men and the boxer also accepted a deal to receive payment for the Klitchsko fight in instalments because of Mr Warren's financial situation. He alleged the £50,000 was given to him over and above any purse he was entitled to. Mr Warren said he agreed the payment terms on the insistence of Mr Hide who was facing bankruptcy at the time. The boxer said instalments could leave him in a stronger financial position. Mr Justice Tugendhat said Mr Warren's overall case was "inherently more probable than Mr Hide's", adding that he had preferred his evidence to that of his former fighter's.